Now you can easily access your email from your Windows® Vista desktop. Add the mail2web.com Log In to your sidebar. 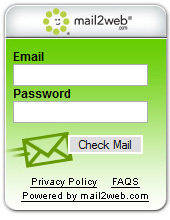 Add mail2web.com log in to any webpage. Download the mail2web.com Google Gadget now! Add a mail2web.com Gadget to your MySpace or other web page. You can copy and paste our code into your own website and visitors will be able to check their email from your site. You can even customize the login form with your colors, font preferences and more.